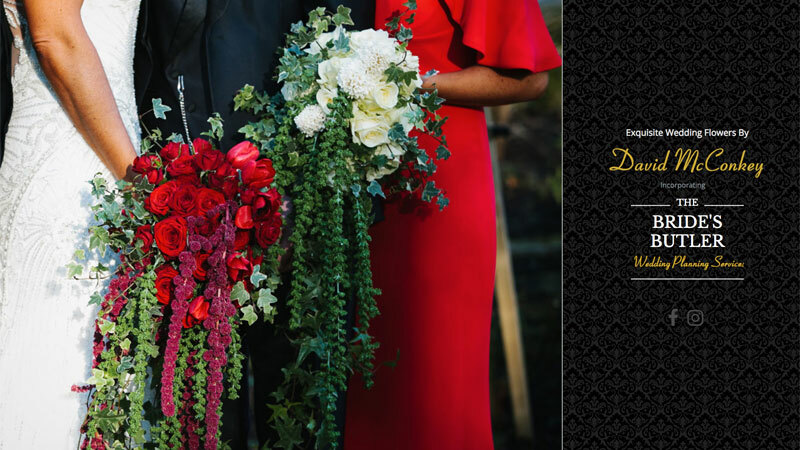 Established nearly thirty years ago, Exquisite Wedding Flowers By David McConkey (to use the businesses full name) is just about the most sought after and respected wedding florist in Northern Ireland. So, when David himself approached us for a new website, we were super excited. As the florist of choice to Irelands high-society weddings we knew we had to raise our game and come up with something stylish, classical and above all else, easy for everyone from young brides to grandmothers to use. David wanted something completely different to his previous webites, so after talking at length and bouncing around various design ideas, we opted for a graphically rich site, with sumptious colours and traditional yet modern fonts. The structure of the site is a mixture of new and old concepts: We have large scaling "hero-header" images atop many of the pages with a more traditional sidebar layout for the main content. To keep things focussed on mobile the sidebars disappears as the screen width reduces, thus keeping the main content area front and centre. A florist website is all about the flowers, so many pages have their own gallery which can be updated remotely. We have been engaged to maintain the site ongoing and expect to be updating it weekly.